It all started with a box of LPs. Well, strictly speaking, it all started with the birth of Dante Alighieri in 1265 and his subsequent writing of the three-part epic poem the Divine Comedy (the Commedia to its friends) begun in 1308 and finished not long before his death in 1321. 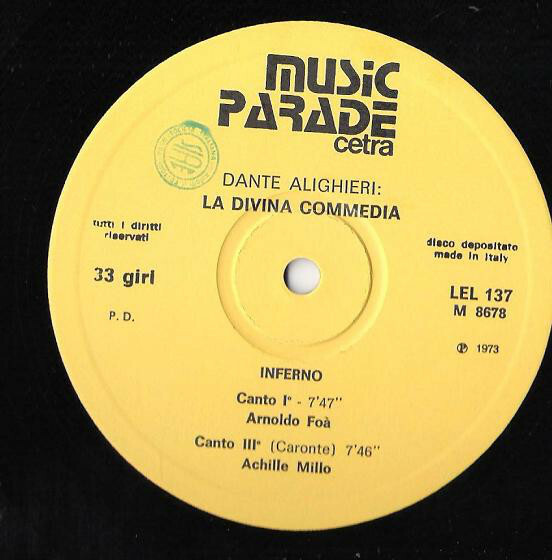 The LPs, a set of recordings pressed by CETRA in 1964, and featuring readings of the complete Inferno, Purgatorio, and Paradiso by Arnoldo Foà, Carlo D’Angelo, Achille Millo, Giorgio Alber-tazzi, Antonio Crast, Romolo Valli and Tino Carraro, were placed on my library desk by the Taylorian’s Italian Literature and Language Librarian, together with a note saying, ‘I thought these might be of interest’. And they were, providing the meeting point of my love for Dante and for slightly old-fashioned recording technologies. The road this took me down was a little unexpected, as I was prompted to contemplate the range of responses that Dante’s writing has provoked over the centuries, from the earliest illuminators and commentators, to the most recent translations, adaptations, and research. This led me to the Taylor’s collections of rare printed books, dating from the 15th to the 20th centuries, to films, operas, and symphonic poems from all across the world and on the internet, and thence to a Taylorian event at which these different media were considered. In 1782 Britain saw the publication of the first full translation of Dante’s Inferno into English, by one Charles Rogers. The first English translation of the entire Divine Comedy, by the Irish cleric Henry Boyd, was published in 1802 (though his version of Inferno first appeared as early as 1785). Thanks to the collecting of renowned Cardiff-born Dante Scholar Edward Moore (a fellow of The Queen’s College and later Principal of St Edmund Hall in Oxford), and courtesy of a long-term loan from The Queen’s College, the Taylor Institution Library holds copies of both of these translations. 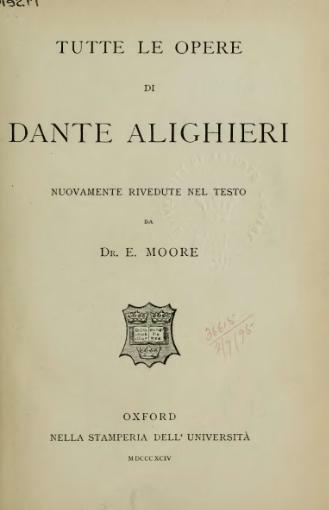 Moore was working towards the end of a 19th Century which saw the growth of both general readerly interest in the Florentine poet and the emergence of the formal discipline of Dante Studies in the Anglophone world. Moore founded the Oxford Dante Society in 1876 and the Dante Society of America was founded by Henry Wadsworth Longfellow, James Russell Lowell, and Charles Eliot Norton in 1881. These three had previously met as a less formal Dante Club while Longfellow prepared his famous translation of the Comedy, first published in 1867. Back in Oxford, our own Edward Moore was also responsible for the first modern edition of Dante’s works in Italian, the so-called ‘Oxford Dante’, printed by Oxford University Press in 1894. This edition of Dante’s medieval texts was a landmark for Dante scholarship worldwide and also had the honour of being OUP’s first publication entirely in a ‘modern’ foreign language.. 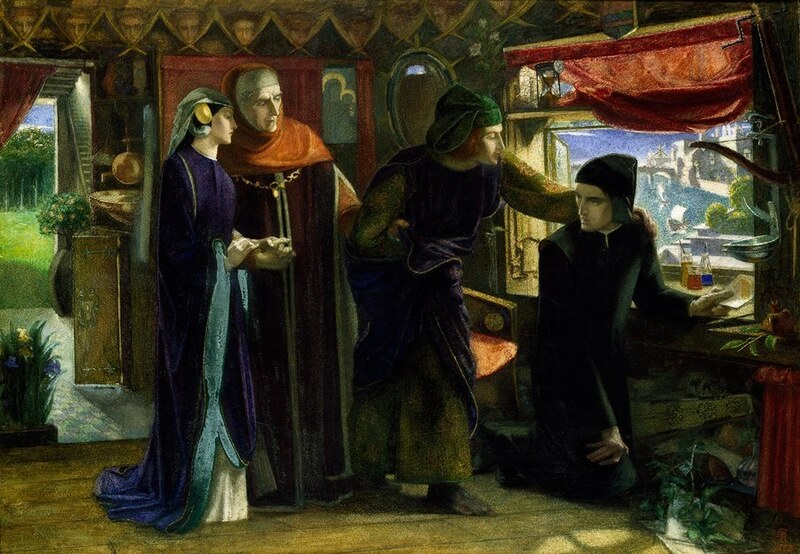 Contributing to this developing context, the Pre-Raphaelites and poets like Alfred Lord Tennyson were discovering Dante’s stories, poetry, and the powerful visual imagery which emerged from his work. Few of the larger collections of pre-Raphaelite art, including that of are without images drawn from Dante. Oxford’s Ashmolean Museum (next door to the Taylorian) has a fine collection of Pre-Raphaelite works, recently re-installed, and includes Dante Gabriel Rossetti’s ‘Dante drawing an Angel on the First Anniversary of Beatrice’s Death’. The 19th century wasn’t the first time that echoes of Dante’s writing had been heard in England. The works of Chaucer are shot through with strands of allusion to and quotation or adaptation of Dante’s writing, especially the Comedy. For instance, the Wife of Bath borrows a few lines on the theme of nobility from Purgatorio Canto 7, and the Prioress’s invocations of the Virgin Mary are indebted to St. Bernard’s prayer at the start of the 33rd Canto of Paradiso. One of the most explicit acknowledgements of Dante as source text comes in the Monk’s Tale, however: the Monk tells the tragedye of one Hugelino and, having recounted the starvation of father and sons while imprisoned by Archbishop Ruggieri of Pisa, he directs curious listeners to read the Inferno (Dante’s telling of the episode is found in Canto 33). Fro point to point; nat o word wol he faille. This early foray of Dante into English was short-lived and we have to wait for Milton’s Paradise Lost for another sustained literary engagement with Dante’s works in English. This is not to say he was unknown in England during the intervening period, however. 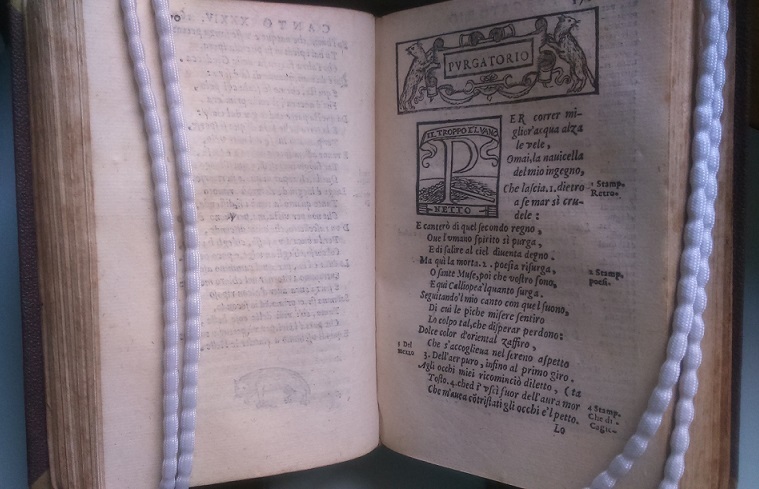 For example, thanks to the antiquarian meanderings of John Leland, we know that, in the 1530s, copies of a Latin translation and commentary of Dante’s Comedy were to be found in libraries in Oxford and in the Cathedral library of my home city of Wells. So Dante’s works were being translated into and read in the common intellectual language of Latin well before they made it into the English vernacular. 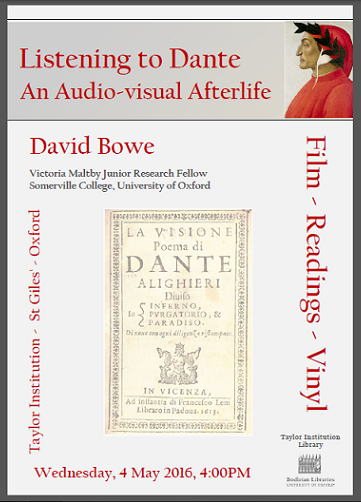 Anyone interested in the fate of Dante’s works in the British Isles would do well to look at Nick Havely’s extensive work on the subject in his book Dante’s British Public, which offers an account of Dante’s readers and the fate of his texts in Britain from Chaucer to the modern day. The imagery used for Dante’s hell in this film isn’t itself entirely original. The directors’ scenography drew heavily from Gustave Doré’s iconic 19th century illustrations of the Divine Comedy. There’s something very striking about those engravings brought vividly to life on film and with special effects which were cutting edge at the time and can still sometimes startle (particularly in the more gruesome torments of lower hell that so captured Nancy Mitford’s admiration). The 1911 Inferno acts as a double adaptation, then, of text into image and illustration into moving picture. 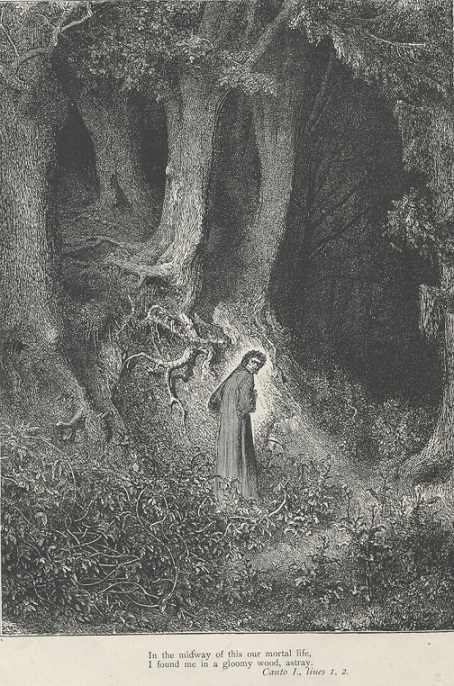 The Doré connection is proof enough (and plenty more is available) that the appeal of Dante (and his creations) beyond Italy wasn’t limited to Britain, or the anglophone world. Liszt’s 1849 Après une Lecture du Dante: Fantasia quasi Sonata is more commonly know as the Dante Sonata, inspired by the Hungarian composer’s reading of the Italian poet’s Divine Comedy. (Connect here to Vitaly Pisarenko’s rendition.) Dorè and Liszt are but two representatives of the rich traditions of translation, reception and artistic response to his work across Europe and Russia, where Tchaikovsky penned a symphonic poem called Francesca da Rimini in 1876, and Rachmaninov was inspired to write an opera of the same name, based on the events of Inferno 5. Tchaikovsky and Rachmaninov were not alone in seeing the musical potential for Francesca’s story, although, of a dozen operas named after Dante’s anti-heroine, only his and Riccardo Zandonai’s remain in the repertoire. Perhaps it is unsurprising that Francesca should be so enthusiastically adopted as a tragic operatic heroine. She is lyrical, enamoured, articulate, and doomed. Her adulterous (incestuous, by medieval standards) affair with her brother-in-law and the murderous wrath of her husband (who will, according to Francesca, end up in Caïna, the zone named for the biblical fratricide Cain and reserved for those who betray, often violently, their kin), are all features that beg for melodrama. Rachmaninov’s opera — available here — opens with a slow build towards the infernal storm — the ‘bufera infernal’ — of Inferno 5, which eternally buffets the souls of the carnal sinners. The score drives the action and reflects this atmosphere. We then see Dante enquiring about the souls and calling to Paolo and Francesca, who identify themselves and utter the immortal lines: “‘There is no greater sorrow / than to recall our time of joy / in wretchedness’” — “‘Nessun maggior dolore / che ricordarsi del tempo felice / ne la miseria’”. Rachmaniov’s swirling, disorienting score gives a vivid sense of the frightening, overwhelming moment of Dante’s entry into Hell-proper, which the poet had previously characterised as a space full of ‘Diverse lingue, orribili favelle, / parole di dolore, accenti d’ira, / voci alte e fioche’ [Unfamiliar tongues, horrendous accents, / words of suffering, cries of rage, voices / loud and faint]. All these, Dante, recounts in Inferno III, ‘facevano un tumulto, il qual s’aggira / sempre in quell’ aura sanza tempo tinta, / come la rena quando turbo spira’ [made a tumult, always whirling / in that black and timeless air, / as sand is swirled in a whirlwind]. The vibrant and violent soundscape evoked by Dante’s poetry lends itself readily to musical and sonic responses, the text of his Divine Comedy often demands that we hear as we read, that we allow ourselves to be drawn into a synaesthetic muddling of sight and sound, just as Dante finds his own senses confounded on the 1st terrace of Purgatory. After a certain amount of milling about on the shores of Purgatory meeting those souls who left their repentance to the last minute, Dante passes through the gate leading to the Mountain where the real work of purgation takes place. The mountain is divided into terraces, each of which is dedicated to the purifying of a particular deadly sinful impulse: Pride, Envy, Wrath, Sloth, Avarice, Gluttony, and finally Lust. The first of these sins is corrected on the first terrace of the mountain of Purgatory and, as Dante emerges onto it, he is faced with three reliefs carved into the living rock. These reliefs depict three scenes of humility, the Virgin Mary accepting the will of God, King David dancing before Ark of the Covenant, and the Emperor Trajan taking time out of his busy schedule to grant justice to a widow whose son had been slain. And these freezes are not the work of man, but the art of God himself, surpassing all other art. Dante describes his sensory confusion in an act of divine ekphrasis: his eyes tell him that he can hear Mary speaking, but his ears tell him no, he can visually smell the incense burning in the scene of the dancing David, even though his nostrils are sure there is nothing to be smelled. Dante is faced with the art of the divine, which is impossible for human sense to fully comprehend or communicate, but Dante gives it a shot… His audacity leads to some beautiful verse and, subsequently, to a vibrant artistic tradition, as generations of artists took Dante’s text as a challenge to produce their own art of the divine. One of the most notable efforts comes from the pen of Botticelli, subject of a recent exhibition at the Courtauld Galleries (London). [Oh how scant is speech, too weak to frame my thoughts. Of course, as with that divine art in the previous realm, this didn’t stop Dante exploring the possibility of representation in words, nor did it deter artists from endeavouring to depict the undepictable, Boccaccio again gives it his best shot, here illustrating Dante receiving a lesson on angelology from Beatrice in canto 28 of the Paradiso. One artist who did eventually embrace the inexpressibility of Paradise, was Liszt, in another Dantean composition, A Symphony to Dante’s Divine Comedy. He had intended to compose a choral third movement to give voice to Paradiso, but was persuaded to shy away from any attempt to express the rapturous heights of heaven in his music, instead concluding his symphonic poem (as it is more often been classified), with a Magnificat. Artists and entertainers, readers and scholars have listened to Dante in a variety of ways over the seven and half centuries since his death: interpretations, translations, appropriations, distortions, and homages ranging from the OUP’s Very Short Introduction, to Electronic Art’s very questionable videogame, from Dante Gabriel Rossetti’s sketches, to Mary Jo Bang’s thematically modernising translation. The Russian poet and essayist Osip Mandelstam, in the Conversations on Dante dictated to his wife in the mid 1930s, said, ‘It is unthinkable to read the cantos of Dante without aiming them in the direction of the present day. They are missiles for capturing the future.’ Our continued fascination with Dante’s poetry, the scores, and texts, and images that have been and continue to be generated and regenerated from those earliest illuminators, commentators, and biographers, to today’s artists, translators, filmmakers and writers demonstrate the continued resonance of his work and the lasting impacts of those missiles from the past. Dante has plenty more to tell us, if we continue to listen. 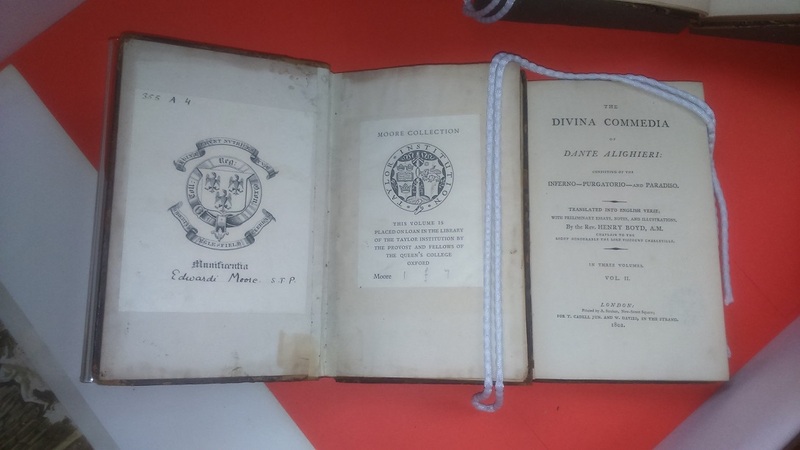 This entry was posted in Special Collections and tagged Dante Alighieri on 18 October 2016 by Clare Hills-Nova. 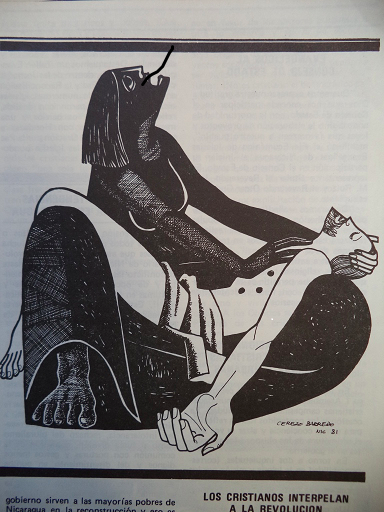 Maximino Cerezo Barredo illustration in the magazine Amanecer. Part I of this series of blog posts introduced the Robert Pring-Mill collection at the Taylor Institution Library and explored Nicaraguan poetry. This second part focuses on serial publications, pamphlets and grey literature. 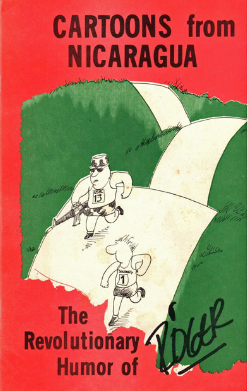 Part III, the last in the series, will discuss the genre known as testimonial literature. It is in the serial publications, political pamphlets and the literacy campaign – La Cruzada Nacional de Alfabetización, with which Ernesto Cardenal was involved – that one can clearly see the role of what Pring-Mill termed “committed poetry”. In these publications, alongside political essays and journalistic accounts of human rights abuses, we find poetry and songs. 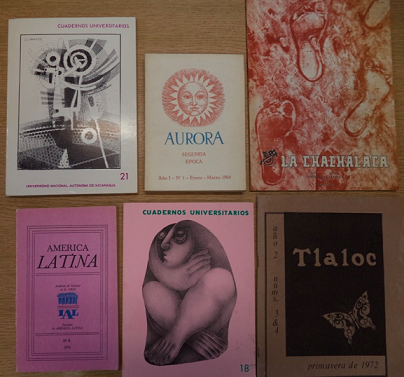 Publications such as Tlaloc, Amanecer, La Chachalaca, student journals, literacy pamphlets and revolutionary martyrs’ obituaries, as well as other genres, show the function of poetry as part of a greater expression of national identity and development. 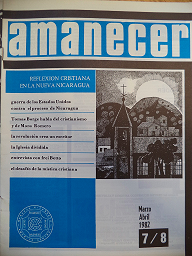 A good introduction to Nicaragua of the late 1970s and early 1980s is the magazine Amanecer: Reflexion Cristiana en la Nueva Nicaragua. It shows the strong links, in Nicaragua, between Christianity and the Sandinista movement. 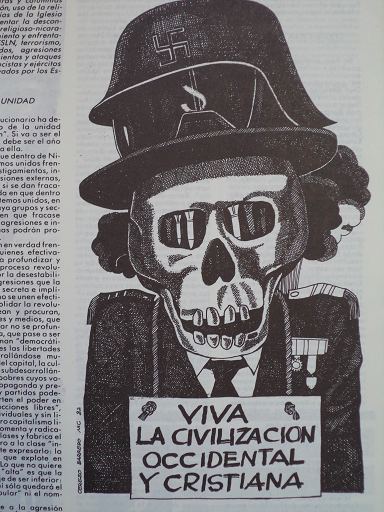 As its official artist and cartoonist it had Maximino Cerezo Barredo, the liberation theologian who produced liberation art throughout Latin America. The magazine provides a good insight into what was going on in Nicaragua politically and socially, covering events from the visit of Pope John Paul II (1983), to cinema festivals and peasant workshops. The Pope’s visit resulted in a variety of articles by prominent figures in the liberation theology movement expressing frustration and disappointment over the pontiff’s position with regard to the Sandinista revolution. Amanecer includes articles and poems from the best-known intellectuals and poets of Nicaragua, authors widely represented in the Taylorian’s collections. We find poetry by Rubén Darío, Rosario Murillo, Ernesto Cardenal (Minister of Culture 1979-87), José María Valverde and other liberation theologians such as Fray Betto and Leonardo Boff, as well as interviews with the historian Hans-Jurgen Prien. 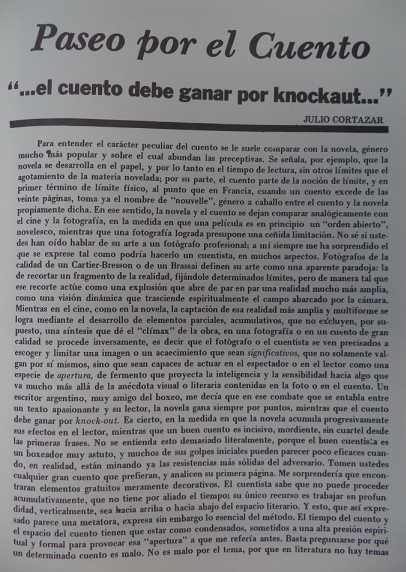 There is political analysis, including the prediction of the escalation of the Contra War (Amanecer, January 1982, p.4), alongside songs and poems. This juxtapositioning shows the deep roots that the oral tradition has in Nicaragua, and the role it plays in its national identity and by extension in its political and social development. The place of poetry in the reconstruction of the country after the revolution of 1979 is also evident in these serial publications. La Chachalaca (1985) was a publication of the Centros Populares de Cultura (Ministry of Culture) with the aim of developing “educational activities that contribute to increasing the level of culture of the citizens” (my own translation). This was the Sandinista project of cultural democratisation. Aurora, a trimestral publication on a variety of topics, comprises political essays, historical analysis, book reviews and poetry including, in 1964, Pablo Neruda’s poem Cita de Invierno. The number of articles on the Soviet Union in both Aurora and another publication, América Latina No. 4 (1976), reflects the close ties between the two regions. The latter, a Russian-Latin American academic publication, was probably collected by Pring-Mill for its article on Pablo Neruda as it includes 20 of the poet’s previously unpublished letters. Various pamphlet series celebrating the lives of combatants who died during the armed struggle were published during the ‘70s and ‘80s. Each pamphlet is dedicated to the biography of an individual revolutionary martyr. Many of the combatants wrote poetry and this is included in each of their biographies. Some biographies also include a prayer or a passage from the Bible and frequently there is a direct comparison between the deceased and Jesus Christ or the Christian martyrs. It is here, as well as in Amanecer, that the influence of liberation theology in Nicaragua can really be seen. 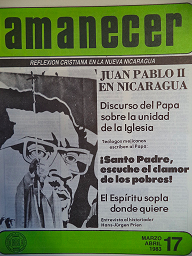 A publication which aims to be pedagogic as well as religious is Historia de la Iglesia de los Pobres en Nicaragua, by the Comisión de Estudios de Historia de la Iglesia en Latinoamérica (1983). The booklet is in a simple language, within a cartoon-like format. It narrates the history of the Catholic Church in Nicaragua beginning with the colonial period and ending with 1979. It explains the differing models of the Church, how the Church dealt with the different historical periods in Nicaragua, and how the Church integrated itself into the revolution. 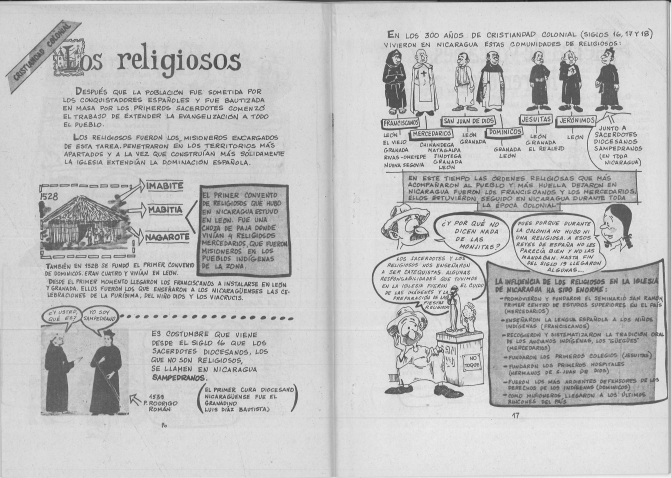 Less religious in focus but told in similar comic-book fashion is a translated booklet of cartoons by Roger Sánchez, a political cartoonist and social critic then aged 24, who also drew for the Frente Sandinista de Liberación Nacional (FSLN — Sandinista National Liberation Front) and its newspaper, Barricada. 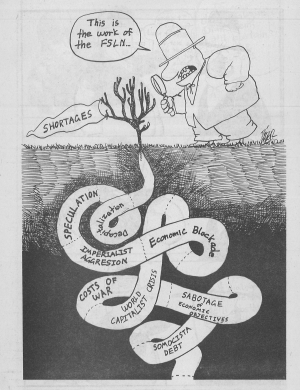 Sánchez’s Cartoons from Nicaragua: The Revolutionary Humour of Roger (1984) was published by the Committee of US Citizens Living in Nicaragua which, though it claimed not to align itself with the FSLN, did want to help change US policy in Nicaragua. Part of the Sandinista project was the creation of a space with possibilities of alliance between the workers and the middle and upper classes. The aim was to increase educational attainment as well as create a shared sense of national-popular identity. 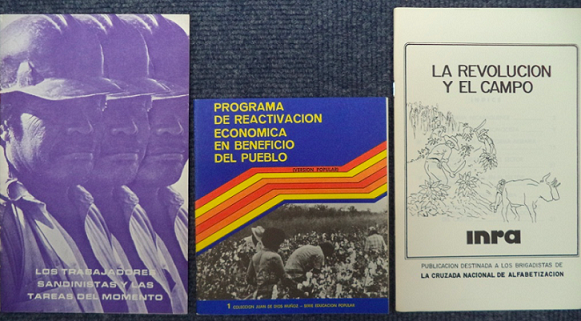 Serie Educación Popular: Programa de reactivación económica en beneficio del pueblo (small booklet version, 1980) is written in clear and simple language explaining what the economic recovery programme consists of, its strategies, aims and related problems. 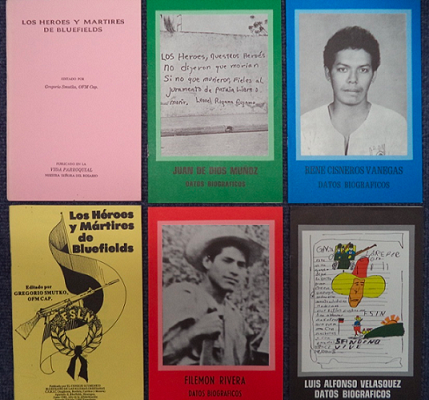 Other pragmatic pamphlets include, Revolución y El Campo: Boletín Informativo by the Centros Populares de Cultura, and Qué es el plan 80? : Plan de emergencia y reactivación económica en beneficio del pueblo: Ministerio de Planificación Nacional, among others. They were an attempt to inform citizens in an open and straightforward language about the economic plans and strategies of the new revolutionary government. 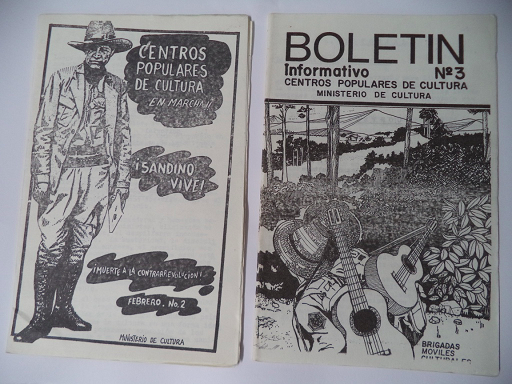 Other pamphlets like these were part of the literacy campaign launched by the Sandinista government in 1980, in what was known as El año de la alfabetización (The Year of Literacy). Beverley, John and Marc Zimmerman (1990) Literature and Politics in the Central American Revolutions. Austin: University of Texas. Forster, Merlin H. and K.David Jackson (1990) Vanguardism in Latin American Literature: An annotated Bibliographical Guide. New York: Greenwood Press. Pring-Mill, Robert “ Both in Sorrow and in Anger: Spanish American protest poetry” Cambridge Review vol.91/ 2195 (1970). This entry was posted in Archives, Special Collections and tagged literacy, Nicaragua, oral tradition, pamphlets, propaganda, religion, Robert Pring-Mill on 3 October 2016 by Clare Hills-Nova.